Eric Gregori will be giving a talk about doing computer vision on the Android platform using the OpenCV library. It will take place at Pumping Station: One’s (https://pumpingstationone.org). 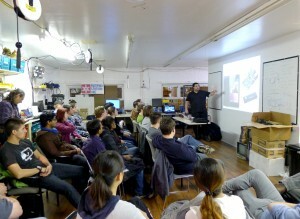 Automated Manufacturing Night on Thursday, 1/10, at 7pm. After his talk and questions, we will discuss, repair, and build CNC machines ranging from 3D printers to electronics pick and place machines. Thanks to Eric for a wonderful talk and to everyone who came out. A recorded version of the talk is available here. Unfortunately, the video and audio quality are low. Eric is the President of EMGRobotics (http://www.EMGRobotics.com). He is a robot enthusiast with over 19 years of embedded firmware design experience. His specialities are computer vision, artificial intelligence, and programming for Windows Embedded CE, Linux, and Android operating systems. Automated Manufacturing Night is a monthly event where a speaker will discuss a topic related to Automated Manufacturing on the third Thursday each month. It is affiliated with the CNC Build Club (http://www.meetup.com/CNC-Build-Club/), a group where folks work on automated manufacturing machines at Pumping Station: One. It is also open to the public. Pumping Station: One is a Chicago hackerspace located at 3519 N Elston, Chicago IL 60618. This talk was organized by Jeff McAlvay, who is working with a team from PS1 on an open pick and place machine (http://www.boardforge.com).